A defragmentation tracker. Used to track fragments that make up a single packet. Definition at line 84 of file defrag.h. Address family for this tracker, AF_INET or AF_INET6. Definition at line 97 of file defrag.h. Destination address for this tracker. Definition at line 105 of file defrag.h. Definition at line 113 of file defrag.h. Definition at line 116 of file defrag.h. Referenced by DefragGetTrackerFromHash(), DefragHashShutdown(), and DefragLookupTrackerFromHash(). Definition at line 108 of file defrag.h. Definition at line 117 of file defrag.h. 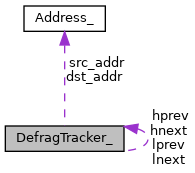 Referenced by DefragGetTrackerFromHash(), and DefragLookupTrackerFromHash(). IP ID for this tracker. 32 bits for IPv6, 16 for IPv4. Definition at line 90 of file defrag.h. Definition at line 120 of file defrag.h. Referenced by DefragTrackerDequeue(), and DefragTrackerEnqueue(). Mutex for locking list operations on this tracker. Definition at line 85 of file defrag.h. Referenced by DefragGetTrackerFromHash(), DefragLookupTrackerFromHash(), DefragTrackerMoveToSpare(), and DefragTrackerRelease(). Definition at line 121 of file defrag.h. Reassembly policy this tracker will use. Definition at line 95 of file defrag.h. IP protocol for this tracker. Definition at line 93 of file defrag.h. Definition at line 102 of file defrag.h. Referenced by DefragGetTrackerFromHash(), and DefragTrackerFreeFrags(). Has this tracker seen the last fragment? Definition at line 100 of file defrag.h. Source address for this tracker. Definition at line 104 of file defrag.h. When this tracker will timeout. Definition at line 107 of file defrag.h. VLAN ID tracker applies to. Definition at line 88 of file defrag.h.